This newsletter is a reminder of the informative and fun evening coming up in 10 days. We hope as many of you as possible can join us! Come and learn more about the fascinating story of this little bit of Norway in Wales. Followed by a fun quiz. Free entry. We hope this short report will keep all members informed about the latest news concerning the Norwegian Church. We will circulate more information closer to the date of the Extraordinary General Meeting (24th February). In the meantime, please get in touch if you have any questions or can offer help with this issue. In mid November 2018, the Cabinet of Cardiff Council agreed a proposal to seek a commercial tenant for the Norwegian Church, “subject to any issues relating to its current Trust status being appropriately resolved”. In December, a manager of the Tourism, Culture and Events section of the council (which includes the Norwegian Church) referred to the plans for a commercial tenant as ‘press speculation’. · We don’t know any details of what the council mean by a commercial tenant for the Norwegian Church. An officer in the council’s Property division has confirmed it will be for the whole building (so it doesn’t sound like just a new cafe franchise). · We also don’t know what they mean by “subject to issues relating to its current Trust status being appropriately resolved”. Could it mean that the council hope to change the charitable objectives or wind up the trust, thus leaving them free to take a more commercial approach to the running of the Norwegian Church? · If the Norwegian Church were to have a commercial tenant, what does this mean for the current public uses of the building as a visitor attraction, etc, and also for the Welsh Norwegian Society? As many WNS members know, Cardiff Council became the sole corporate trustee of The Norwegian Church Preservation Trust in 2006. Although it is under the wing of Cardiff Council, it is still a charitable trust, and is subject to all the usual charity regulations and also the particular charitable objectives stated in the original deeds (essentially to preserve the building and maintain it as a leisure and amenity facility for the public). Given WNS’s long history of connections to the Norwegian Church and our special status*, does WNS wish to act as a guardian of the Norwegian Church as we know it, and aim to protect it from the possible implications of a commercial tenancy? Do we also wish to protect our longstanding free use of the building for our WNS meetings? We will formally ask members for their views at the Extraordinary General Meeting on Sunday 24th February. WNS is in the unique position of having greater awareness and understanding of the issues than the majority of the public who use and support the Norwegian Church. It is likely that most people are unaware of the Cabinet’s decision. The Trust status and the associated charity issues are probably not widely understood. The WNS committee has decided to join Cardiff Third Sector Council as a member organisation. We have already asked C3SC for advice about the issues surrounding the Norwegian Church Preservation Trust. We will also write to Cardiff Council and diplomatically ask for more detailed information about the council’s plans for the Norwegian Church. We will ask to be consulted on the future plans, and ask again for the Norwegian Church Advisory Committee to be reinstated, with WNS as a member. The Cabinet meeting in November also agreed that Cardiff Council will purchase Britannia Park from Associated British Ports (ABP). Cardiff Council will then become the ground landlord for the Norwegian Church, as well as the corporate trustee of the Norwegian Church Preservation Trust. This would seem to be a good thing, at least from the point of view that it removes the worry that the Norwegian Church’s ground lease from ABP was due to expire in a few years. Cardiff Council does want to develop the land surrounding the Norwegian Church but, it seems, on a less extreme scale than the Dolffin Quay proposals put forward by ABP in 2017. The Council will of course be fully aware of the level of public opposition to the Dolffin Quay scheme. People involved in the Dolffin Quay campaign are naturally keeping their ears to the ground for news of future developments on Britannia Park, surrounding the Norwegian Church. Hopefully it will be development of a more appropriate, human scale, while maintaining the parks as recreation spaces. We’ve heard talk that some development will be proposed along the waterfront strip running north from the Norwegian Church towards the Senedd (the grass area with trees). The WNS Committee will ask to be involved in pre-planning consultations about this development. The Norwegian Church Preservation Trust was formed in 1987 to preserve the then derelict Norwegian Seamen’s Church. Charitable donations were raised from Hordaland Fylkeskommune (£90,000) and Cardiff Bay Development Corporation (£50,000), and numerous other organisations. The Trust eventually secured a prime waterfront location for the reconstruction of the Norwegian Church at the heart of the Cardiff Bay development (the Norwegian Church was officially reopened in 1992). It was an independent charitable trust from 1987 to 2006. In 2005, the Trustees approached Cardiff Council to ask if they were interested in becoming sole corporate trustee of the charity. The long-serving Trustees had various reasons for wanting to step down, including family and personal circumstances. They initially tried to find individual new trustees but did not find enough interested people. The transfer was agreed and took place in May 2006. Cardiff Council has been the sole trustee of the Trust since then. After the reconstructed Norwegian Church had reopened in 1992 (as a visitor attraction and arts centre), the Welsh Norwegian Society was formed to maintain the community of people with connections to the old Norwegian Church and its congregation, and also to encourage cultural links with Norway, etc. 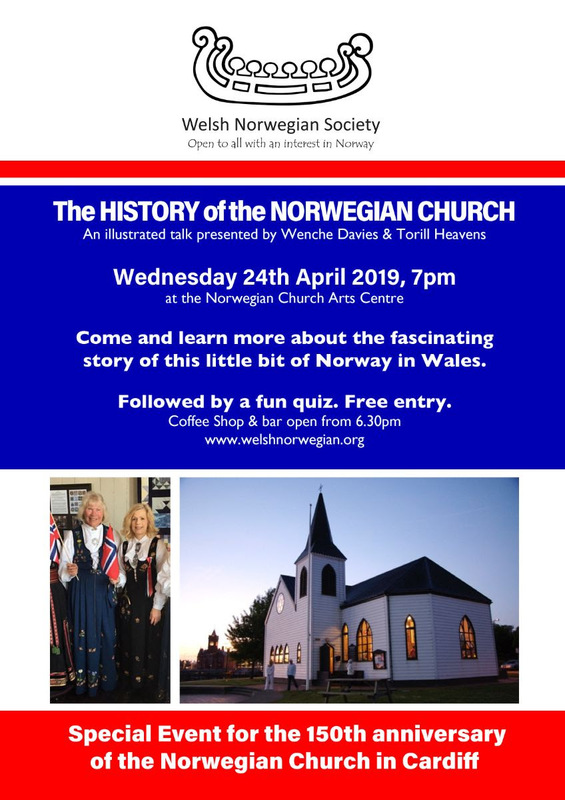 Several key people with connections to the old Norwegian Church were founder members of WNS and have been long-serving pillars of the Welsh Norwegian Society, and also the former Norwegian Community coffee afternoons. Also, there was always a strong representation of WNS members who served on the Management Committee of the Norwegian Church itself - the management committee was appointed by the Trustees to oversee the day to day running of the building. Over the years, WNS members have given countless hours of (unpaid) time towards cultural activities and the general running of the Norwegian Church. Importantly, WNS is the only group to have always been granted free use of the Norwegian Church Arts Centre, due to its special status as a continuation of the old congregation and a promoter of ongoing cultural links with Norway*. When the original Trustees of the Norwegian Church Preservation Trust handed over to the Council in 2006, they asked for this recognition of WNS to be continued. It was agreed that an Advisory Committee would be formed by Cardiff Council to guide the management of the Norwegian Church, with representation from WNS, Hordaland, ABP (landowner), etc. This was formally recorded in Cardiff Council’s Executive meeting of April 2006. In reality, the Advisory Committee sadly petered out. WNS and Hordaland have raised this with the Council many times, asking for the Advisory Committee to be reinstated, but the council have effectively batted away the questions. *The former Norwegian Community coffee afternoons were also given free use of the Norwegian Church, but sadly this group ceased to exist around 2012 when their use of the building became more restricted. Thankfully, the WNS coffee afternoons are a happy revival of this tradition. Christmas is upon us once again and 2018 is coming to an end. The committee wishes all members and friends of WNS a happy and peaceful Christmas, and a fantastic New Year! Members of the Welsh Norwegian Society gathered at the Norwegian Church Arts Centre in Cardiff Bay to celebrate Christmas with a traditional party. 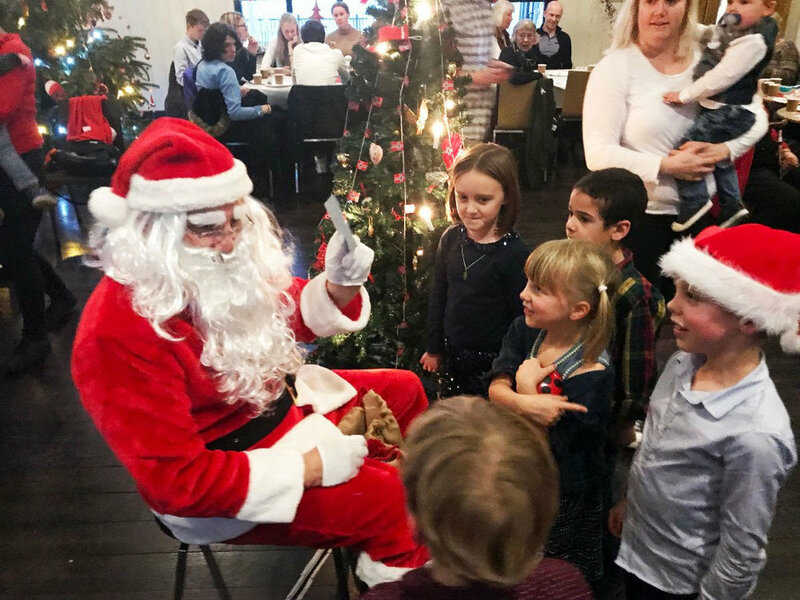 Old and young were at the venue to sample more than seven sorts of traditional Norwegian Christmas cakes, join in the singing and dancing around the Christmas tree and meet Father Christmas, who brought presents for the children. More than 50 people attended the event, which also saw some members telling stories from their Norwegian Christmas experiences. Six exchange students from Hordaland county in Norway, which is twinned with Cardiff, also attended the event. The 2018 Juletrefest was a great success. Here is a short video of the festivities. The dates of WNS events are below. All are held at the Norwegian Church Arts Centre, unless otherwise specified. Saturday 22nd June: St Hans fest, venue TBC. Sunday 28th July 2019 2-4pm: Coffee and cake, may be cancelled as it’s in the school holiday. Sunday 22nd September: Time TBC, choir from Norway to perform. Possible date for AGM. Monday 16th December 2019 (daytime): The Norwegian Church’s official 150th anniversary with officials and media invited. There has been a fair amount of press coverage recently suggestion that the future of the Norwegian Church is uncertain. Members may want to have a look at the below articles, which give a good background to the Church and the challenges it might be facing going forward. What kind of involvement, if any, would the members like to see WNS have in the debate on the future of the church? It is important that we seek the views of the membership if we as a society intend to publicly get involved in this debate. Please email your thoughts, suggestions and comments to contact@welshnorwegian.org, and indicate whether you would be able and willing to be involved in working on this matter. This event is a social gathering for members and friends of the Welsh Norwegian Society. We are a not for profit organisation, the cost to join will cover BBQ, charcoal, wood for the fire, coffee, tea, squash for children and some sweets after the food. You must bring your own food to barbecue, drinks, salad etc. Also plates, glasses, cutlery and chairs/picnic blanket to sit on. Book a space through contact@welshnorwegian.org no later than Saturday June 16th. The price to join is £5 for adults and £2 for children. Payment will be taken on the day, so please bring accurate money as we might not have exact change with us. We will send you the full address to the venue when you have booked a space. We welcome you to bring music or any instrument if you play any. We would love some impromptu entertainment!! The owner of the garden has welcomed people to camp but can only offer access to toilet and water. Please note; there are no shower facilities. If you wish to camp, please let us know and we will give you more information. There is limited space for tents. We would like to highlight that this is not an official campsite with access to facilities such as showers or washing up area. However, the owner of the garden have given us access to toilets and also offered people to stay for two nights if they wish to. She has not given us a specific time to be packed up, but I would like to ask that we leave the garden in the same way as we found it, making sure that we take all rubbish with us. There are also restricted parking facilities, so we ask that people who are camping could park in the drive, allowing those who are not camping able to leave in the night without moving any parked cars. Last Thursday, May 17th, Cardiff Bay came alive with brass band music and happy children waving flags, as the Norwegian contingent in South Wales took to the streets to celebrate their national day. It was a gloriously sunny day, and the Norwegians wearing traditional costumes and their very finest clothes, paraded in traditional fashion from the Millennium Centre to the Norwegian Church Arts Centre, where they celebrated their country’s independence. The Norwegian independence day is still celebrated with great enthusiasm all over Norway. It is impossible to overestimate how important this day is to most Norwegians. Norway is quite a young nation, having received its independence from Sweden is 1905, and it is after all not very long ago that Norway was occupied during the Second World War. So people feel it is most definitely worth celebrating that it is a free country in peacetime. You will see no guns and tanks in the streets in Norway during their celebrations, rather the streets are filled with happy children and adults carrying Norwegian flags and shouting hurray, accompanied by brass bands. It is the people's, and especially the children's day. Norwegian groups all over the world celebrate in the same way, and in the UK there is a large and very popular celebration in Southwark Park in London, every year attended by thousands of Norwegians. In Cardiff, the celebration is led by the Welsh-Norwegian society, a society started to strengthen the Welsh-Norwegian relationship. People come from all over South Wales and the West Country to celebrate. This year, as is tradition by now, the group congregated outside the Millennium Centre, where they started off the day with some songs, then paraded to the Norwegian church and arts centre. Here the Norwegian flag was raised and the national anthem sung, accompanied by the Salvation Army band. The group moved inside where they this year were entertained by a string quintet from the Royal Welsh College of Music and Drama, playing pieces by Grieg. Later there were speeches and a wreath laying ceremony in memory of the people who have fallen during the World Wars. The event was rounded off with coffee, cakes and waffles in traditional Norwegian style, and at the end there were children’s games on the lawn. Finally – the Welsh Norwegian Society had a Norwegian style buffet meal with a Norwegian twist for members. The Norwegian Church Arts centre is always very supportive of the 17th of May celebrations and do everything they can to support the event, something the WNS is very grateful for. All in all it was a lovely day. Cardiff Bay showed off its best side, with sparkling seas, a warming sun and a clear blue sky. The parade livened up the streets with colourful national costumes, with sparkling traditional jewellery and red, white and blue flags. Outside the church, the Norwegian flag waved leisurely against the blue skies, framed by green leaves and the pretty white church, much like it might have welcomed the weary Norwegian sailor all those years ago. Unfortunately due to the snow and weather condition and the fact the most of us have left our winter tyres and skis in Norway we have made the decision to cancel today's Coffee and Cake with the Welsh Norwegian Society at Norwegian Church Arts Centre Cardiff in the interest of personal safety. Cardiff Council has launched a public consultation on the economic vision for the city, based on the Green Paper Building More and Better Jobs. The paper considers a range of issues for Cardiff, as well as proposed projects to help improve the city’s economy. It also outlines a proposed spatial strategy for the future development of the city. We are seeking the views of people in Cardiff to help inform the development of a White Paper to be published this year. Responses are welcome until the end of March from anyone and do not have to specifically answer the questions included in the paper. These are intended only as a guide to help shape discussion and responses. As we would like to reach as many people as possible, please share this with friends and colleagues. All this cold and crisp weather is almost making our Norwegian members homesick! Our February meeting will warm you up! Speaking of warm, the January meeting was lovely, informative and hopefully resulted in some woolen creations. January’s coffee and cake meeting had a different activity with a focus on knitting and crochet. WNS member Dr Torunn Kjølberg delivered an interesting talk about Norwegian knitting culture and history, and we had a live demonstration on how wool yarn is spun by Gillian Thomas. On March 6th in St. David's Hall, Cardiff there will be a lunchtime concert at 1pm with the outstanding, multinational Engegård Quartet! They will be performing Haydn - String Quartet op.76 no.2 and Grieg - String Quartet in G-minor op.27. Members of WNS are invited to meet up before the concert for socialising and an informal lunch. Get in touch for more information or check out the quartet's homepage.